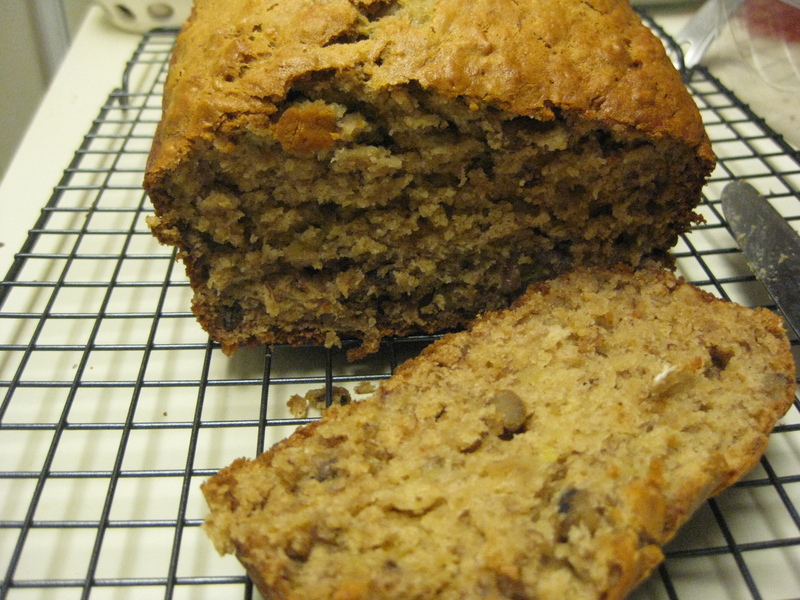 This is a variation on a recipe by Cooking Light for an oatmeal banana bread. It’s low-fat and delicious. Like any banana bread, you can leave out the nuts. Instead, mix in whatever you have in your pantry from dried currants to chocolate chips to coconut flakes! Preheat oven to 350. Lightly grease a 9×5 loaf pan with non-stick cooking spray. In a large bowl, whisk together the banana, eggs, milk and oil. Stir in the brown sugar and oats. Stir in the baking powder, baking soda, salt, cinnamon, nutmeg and ginger. Whisk in the flour and nuts, just until mixed through and moistened. Bake an hour and 10 minutes or until set in the center. Cook 10 minutes on a rack before removing from the pan. Hello loyal muffin-bites readers! 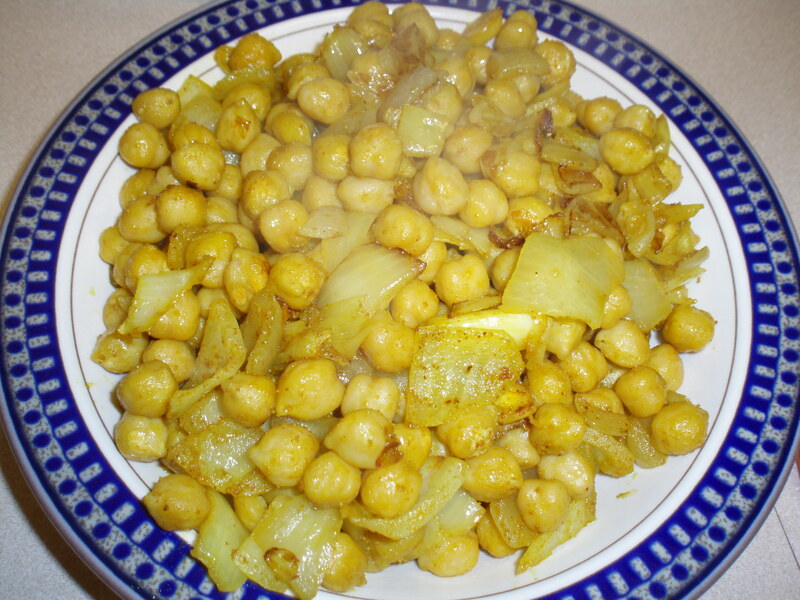 I’m Sarah B. and I just made two chickpea dishes that I wanted to share with you. The back-story on my chickpea overload: I’m currently a graduate student in library school (woot woot! ), and I’m an officer of a student group. We had an unfortunate situation recently that involved a miscommunication when we ordered t-shirts, and we got double the amount we thought we were going to get and then subsequently had to pay for said shirts. This drained our bank account. I was putting on an event where I had promised food for the hungry masses of graduate students and decided to go the inexpensive route and buy dry chickpeas and make a dish to bring in. 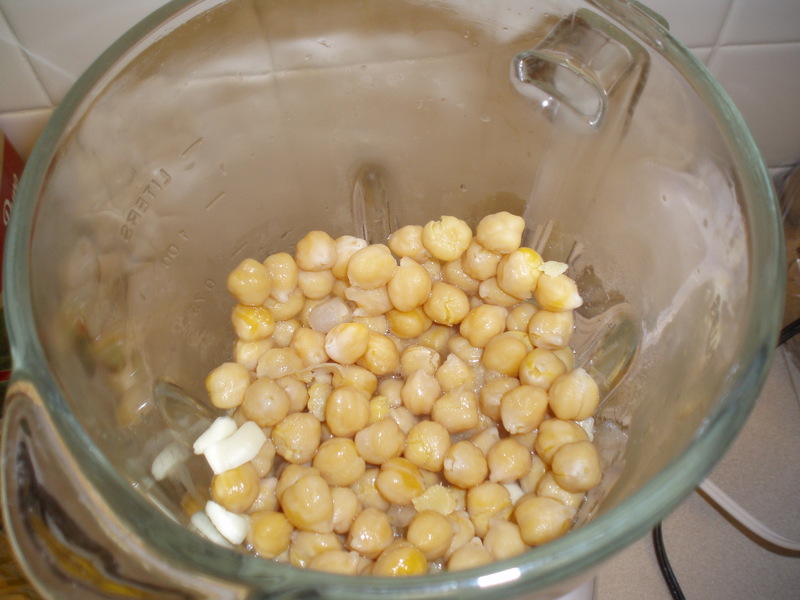 Now, I don’t have too much experience with making chickpeas, but I knew I wanted to feed hungry people so I probably bought about 15 or 20 CUPS of DRY chickpeas (to feed, I don’t know, perhaps 10 or 15 people… too many chickpeas). 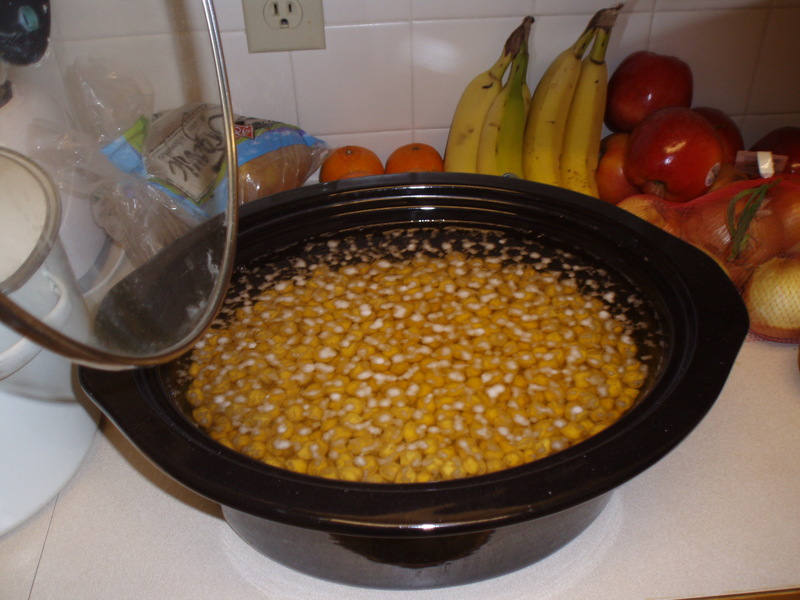 Well, when one makes anything with dry chickpeas, one must soak them for several hours (preferably overnight). Being a good chef, I did just that. Sadly, after I had started soaking them, I learned something invaluable that I really probably already knew but hadn’t had it illustrated for me recently: chickpeas expand in water. I know, I know, shocking. But, my many many little chickpeas turned into a GIANT pot of soaking chickpeas AND a many-quart crockpot (used as an overflow container). Whoops. Luckily I had an event, and people were going to eat all my chickpeas! Wrong. The event got postponed. Sigh. Now I had a million little soaking chickpeas that I had to do something with for real. Actually, I would have had to make them all anyways, but it just added to the story I guess. Well, I know two chickpea recipes: 1) something my sister told me and 2) hummous. Here you go! My sister gave me this recipe, and it’s really good. I guess her friends started calling it Barbonzo beans, because she would make it for her friends and they titled it after her last name. Heat some oil in a frying pan & put in a clove or two of garlic (cut up or minced or sliced) and an onion (chopped). 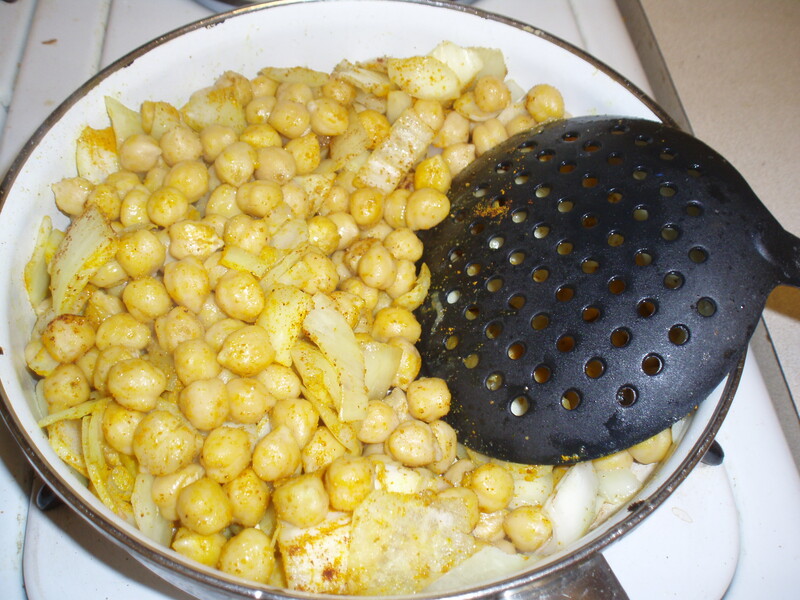 If using canned chickpeas, open a can or two (15 oz each) of chickpeas, drain, rinse, drain and add to the pan when the onions have softened. Add some cumin, chili powder, and then turmeric for color. Salt if desired. If you have a lemon or lime, a squeeze of that is quite nice. *I found that using a straining sort of utensil, pictured above, works really well here. Well who knew hummous was so freaking easy?! Not this girl. Works better in a food processor, I’m told, but I only had a blender. Add vegetable oil to your blender (or food processor), a bit of salt (to taste), several tablespoons of lemon, and two cloves of garlic. 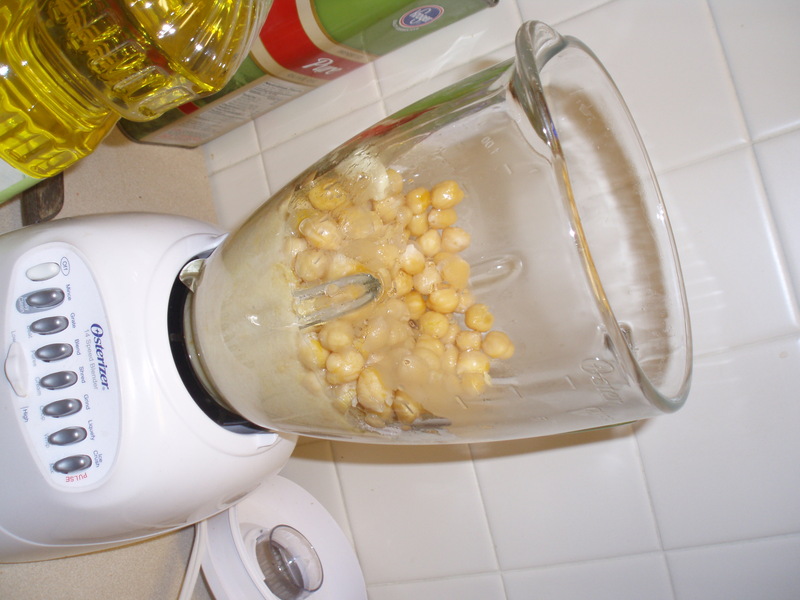 If using canned chickpeas, open a can (15 oz) of chickpeas, drain, rinse, drain and add to the blender. 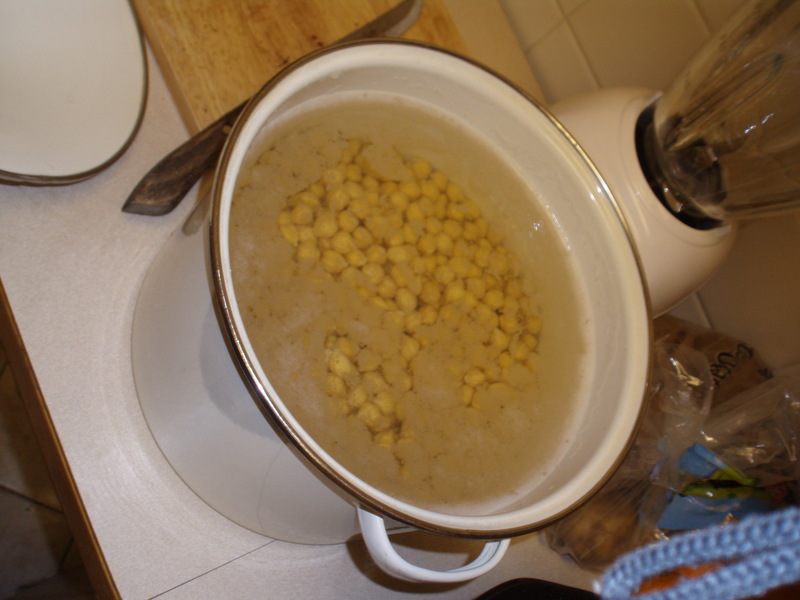 If using dry chickpeas, soak for many hours (hopefully overnight), rinse, drain, boil in water for ~1 hour or more or until VERY soft. THEN add to the blender (drained). Blend, but not so you wear out the motor. If your blender is struggling, add a bit of water. Blend a bit, and then scoop around in there with a fork or spoon, so you can get it as smooth as you want it (this is where the food processor comes in as being a bit more useful). I added some tahini to one batch but didn’t love it as much as the batch without it, so add that to taste. I’m sure there are many variations on this, but I was pretty surprised at how easy this was. A good coffee cake isn’t dry, requiring a side of coffee. Instead it is light with flavors that go well alongside your favorite cup of joe. This week I needed to bring something into work for a mid-morning celebration. I wanted something that was a little sweet, pretty healthy, and easy to put together. This cherry yogurt coffee cake is all of that and more. I made it with frozen dark cherries, because they are always in my freezer for my breakfast smoothies. I cut them in quarters while frosty and allowed them to thaw and drain before baking with them. You could also cut them and use them frozen, but you will want to add a few extra baking minutes and be prepared for a cake stained with the extra cherry juice (not necessarily a bad thing!). Preheat your oven to 350. Prepare an 8-inch square baking dish by lining it with parchment paper (or tinfoil) and lightly spraying with non-stick cooking spray. 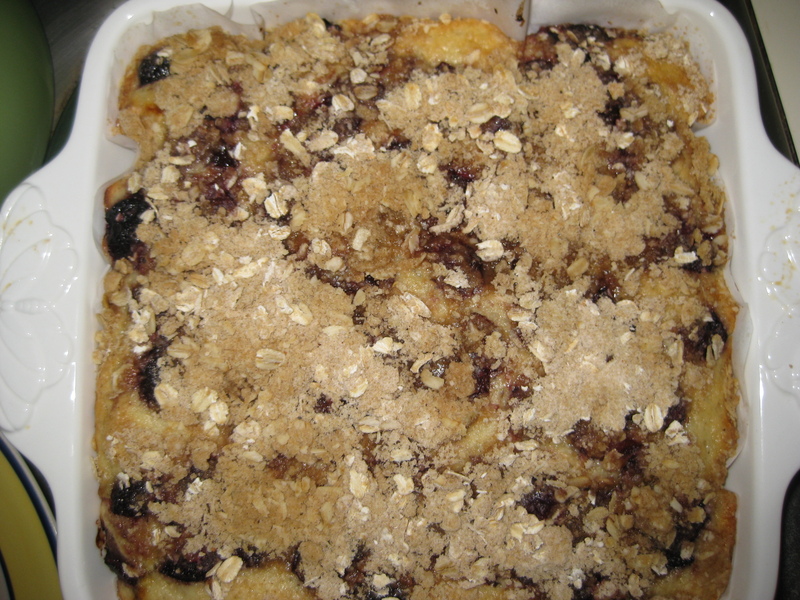 In a medium bowl, combine 1/4 c flour with brown sugar, oats, cinnamon, 1 t nutmeg, and 1 T margarine. Use your fingers to break in the butter or two knives to cut it in, until the mixture resembles coarse cornmeal. In a large bowl, cream 1 1/2 T margarine with the sugar. Mix in the yogurt, extracts and egg until well combined. Stir in the remaining 1 1/2 c flour along with the baking powder, baking soda, salt and nutmeg. Spread the batter in the prepared baking dish. 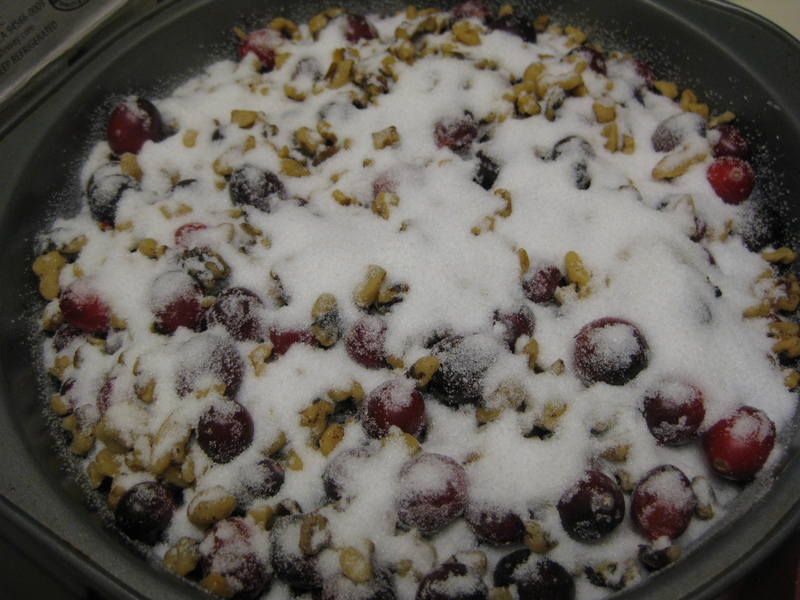 Sprinkle the cherries on top of the batter, and then sprinkle the oatmeal topping over the cherries. Bake 35-45 minutes, or until the center is set. Some people think of blondies as brownies that forgot the chocolate. Those people are wrong! 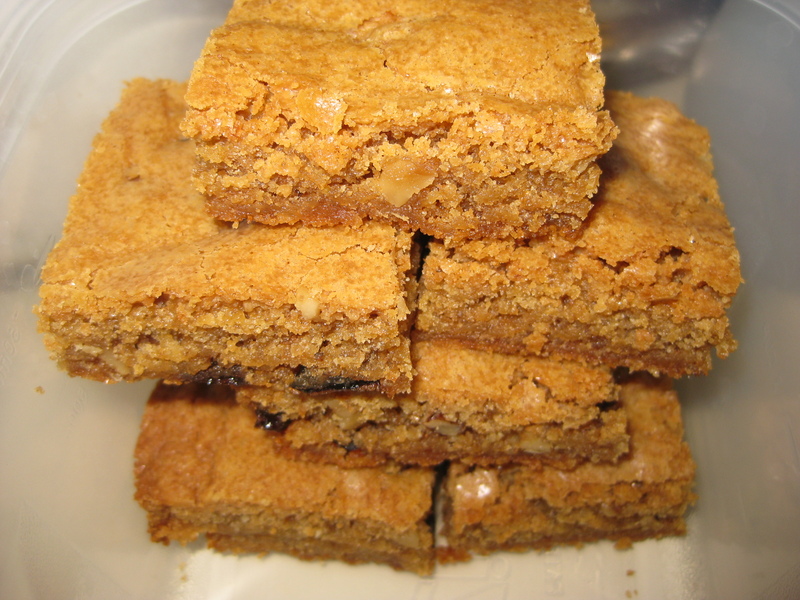 Blondies are delicious cookie bars full of brown sugar, which makes them taste like molasses and butterscotch. This basic recipe is a take on one from my high school Home Ec. class. What is great about this recipe is that are countless ways to adapt it and switch it up, so it never gets old. Try it plain or mix in your favorite candies, nuts, fruits and more! Preheat your oven to 350. Line a 9×13 baking dish with tinfoil and lightly coat with non-stick cooking spray. 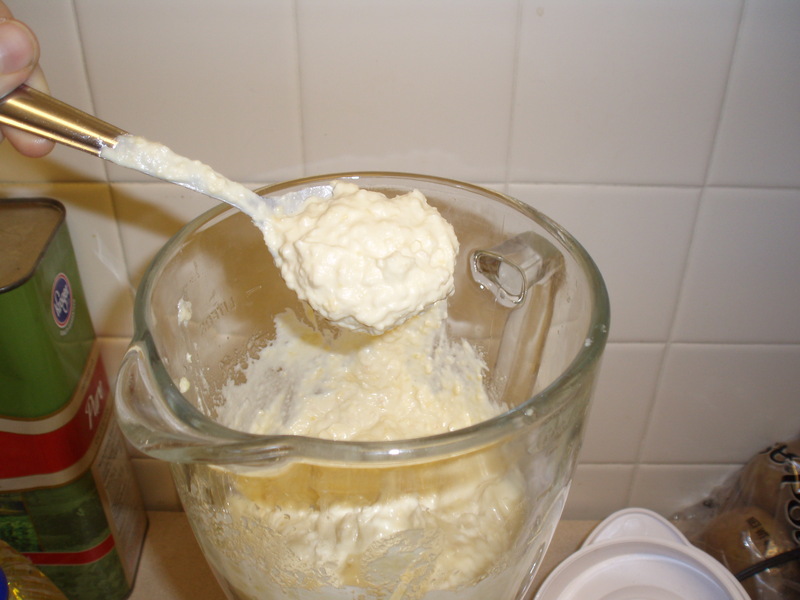 In a medium bowl, mix together your melted margarine and brown sugar. Stir in the eggs and vanilla. Mix in the flours, baking soda & powder, nutmeg and salt. Add in any mix-ins you want. Today I used chopped walnuts and dried cranberries & raisins. Spread the mixture into your prepared pan. Bake for 45-50 minutes or until set in the center. Allow to cool before cutting into blondie bars! Eggplant is particularly underused in cooking — maybe because it can look so intimidating and purple! 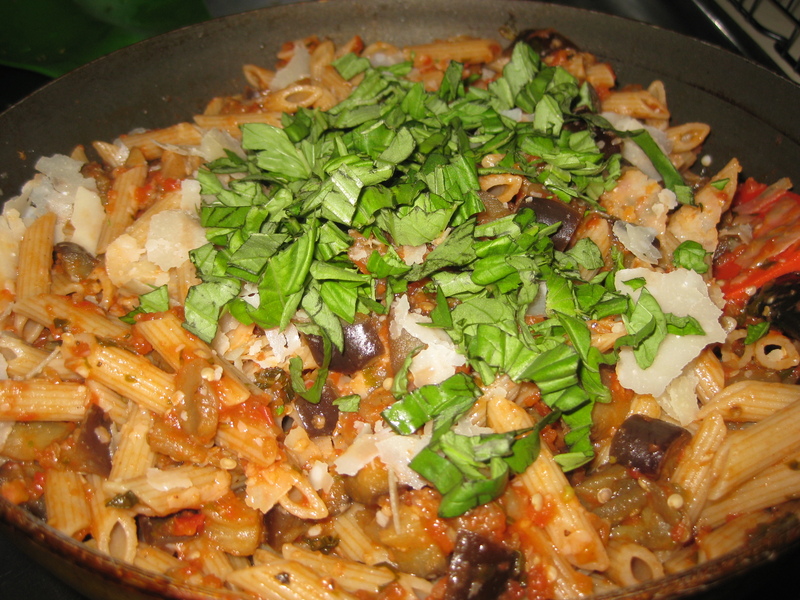 This is a hearty winter pasta dish that is light on the sauce and full of eggplant. Hope you like it! Place the eggplant in a colander. Sprinkle liberally with salt. Allow to drain for a half hour. Rinse well and pat dry. Meanwhile, in a heavy saucepan, heat up 3 T olive oil. Add the garlic and saute for 1-2 minutes. Add the tomatoes with juice, onion and fresh basil. Stir and allow to simmer over low heat for about 30 minutes, stirring occasionally. Remove from heat and puree in a blender. Heat 6 T olive oil in a large non-stick skillet. Add the eggplant, red pepper flake, garlic powder, and lemon juice. Saute the eggplant until cooked through and crispy, approx. 7-10 minutes. Remove from heat and allow to drain on paper towel. Meanwhile boil a pot of salted water. Cook penne according to instructions, draining 2 minutes shy of al dente. Toss pasta with warm tomato sauce and eggplant. Sprinkle with shaved Parmesan and fresh basil! Back around Thanksgiving, I couldn’t help myself and bought quite a few bags of fresh cranberries. Call it a tribute to growing up in New England. Of course I didn’t manage to use them all up (mostly because I wasn’t the host of Thanksgiving dinner this year), so I froze a number of the bags. 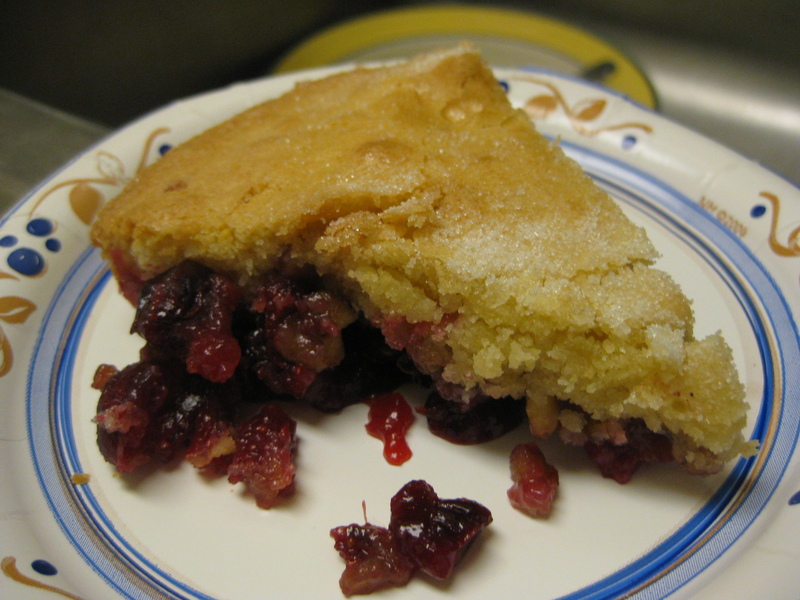 Then I stumbled on a recipe for “Nantucket Cranberry Pie” by Pioneer Woman. Cranberries? In a pie that’s really not very much like a pie? That’s from Nantucket???! How could I not try it? Behold my slightly adapted variation! Preheat the oven to 350. Generously grease a pie plate (or cake pan) with softened margarine. 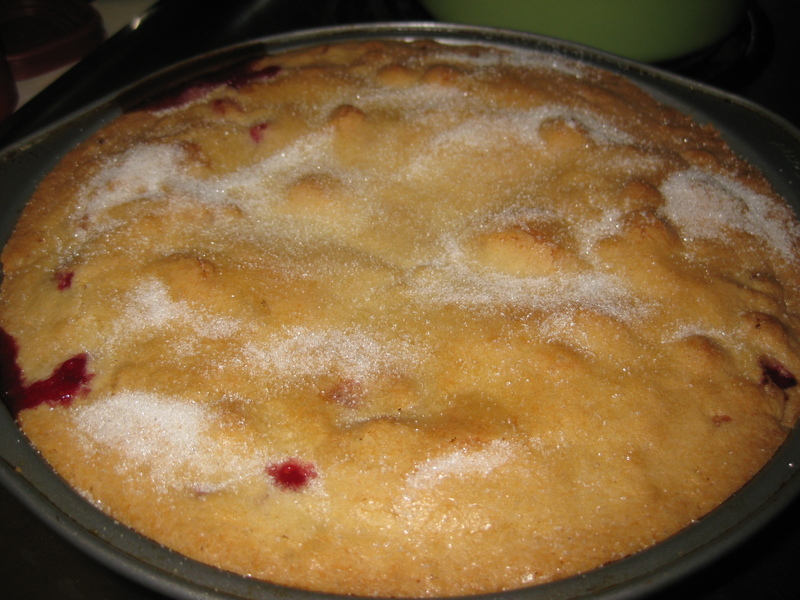 Dump the cranberries in the pan and try to even them out. Sprinkle them with the chopped nuts and then 2/3 c of the sugar. In a medium mixing bowl, combine the flour, 1 c sugar, melted butter, eggs, almond extract, vanilla extract and salt. Stir gently to combine. Pour batter over the top. Use large “ribbons” of batter to evenly cover the surface. Spread gently, if needed. Bake 45-50 minutes. 5 minutes before removing from the oven, sprinkle the surface of the pie with the last tablespoon of sugar. Enjoy! You are currently browsing the Muffin Bites blog archives for January, 2011.